On 11.08.2013 I recommended Hindalco Industries Ltd on this blog @91.35 and after that Hindalco touch, 198.70 on 25.07.2014 and my followers make more than 100 percent profits in this recommendation. For new readers here is the link to this past recommendation. 1. Hindalco Industries Ltd is a 1 rupee face value Group A stock which traded at 101.75. 2. Promoters holding is 36.99% ( If you read my earlier article about Hindalco then you noted that in June 2013 promoters holding is 32.06 %), So increasing in promoters holding is a good sign. FII holding is 27.82 % they also increase their holding from 26.53%, DII holding 13.62 %. This promoter holding pattern is an adamant holding pattern due to increasing promoters and FII holdings. 3. Hindalco Industries Ltd Recommended 1.00 Rupee per share dividend and ex-dividend date 07.09.2015 is still due, so our readers avail a dividend in their holding periods. 5. Hindalco Industries Ltd net sale per share is 167.19, and if we compare from my August 2013 article on Hindalco, then net sale per share is the increase from 136, so increasing sales is also a good sign. 6. Base Price for Hindalco Industries Ltd is 127.48 so stock reasonably below his base price. 7. Year high of Hindalco is 198.70 and year low 99.20 now this ratio of year high/low ratio is exactly 2.So some of my followers may ask that as per my book I do not buy any stock which year high/low ratio is below 2 ( I think in next 2-3 trading sessions Hindalco year high/low ratio cross below 2) then why I recommended to buy it? Now we come to the main point: - when a stock year high/low ratio cross below two then we think more downside will remain. 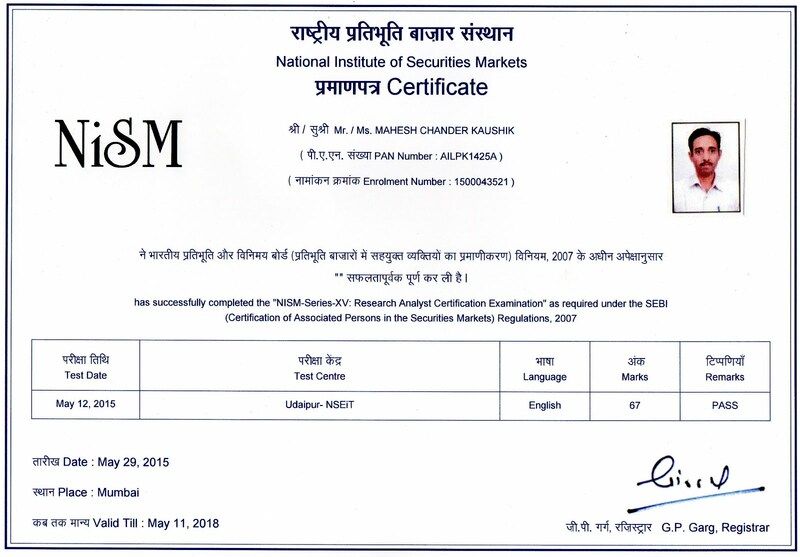 Discloser: - I Mahesh Chander Kaushik author of this research report is an existing research analyst and passed NISM certification for research analysts. I am also applied for a grant of registration under SEBI(RESEARCH ANALYSTS) REGULATIONS, 2014 hereby disclose about my financial interest in the subject company and the nature of such financial interest:- 1 Me and my associates or relatives have no any stocks of Hindalco Industries Ltd company so my personal interest is not included in this stock. 2. Me and my associates or relatives have/have not any actual/beneficial ownership of one percent or more securities of the subject company(Hindalco Industries Ltd). 3. Me and my associates or relatives have /have not any other material conflict of interest at the time of publication of the research report. 4. Me and my associates or relatives have/have not not received any type of compensation from the subject company(Hindalco Industries Ltd) in the past twelve months. 5. I am not served as an officer, director or employee of the subject company(Hindalco Industries Ltd). 6. I have been not engaged in market making activity for the subject company(Hindalco Industries Ltd). Mahesh ji I agree that your readers/followers have made more than 100% profit on this share but how about your other recommendations? For eg MMTC in this very list of 2016 stocks where you made the buy call@ 47 in Aug 2015 but today on Nov 2 it was closed at around 43. My question is out of all these 2016 or other stocks recommended by you in 2014 and 2015 what is the percentage or number of stocks have seen the substantial growth? For eg if in 2015 you have recommendeed 10 stocks then how many stocks out of these 10 stocks have seen a significant or even some growth and how many have of them have incurred loss? Ok so as per your penny share performance report no stocks you have recommended have incurred loss to anyone which is quite phenomenal. I can see you work so hard on all the stocks before you recommend them to your followers and that pays off. However just one thing I couldn't find with those penny stocks is the timeframe recommended by you one should hold those stocks for. What I meant is some of your stocks gave more than 100% returns within a month while some gave the good returns over the 2-3 years of timeframe so if you provide the timeframe too with the targets i.e. stock A might give return upto X% within X months then that is great otherwise again an investor would be confused and might panic too once a stock recommended by you started going down in short term which would eventually give the higher returns if held for long term. Please dont mind my questions and dont take it as a criticism either I am not trying to criticise your hard work or talking any little of you or your hard work. I am just trying to make sure you are the right guy I could count on because so far you look quite promising to me. 1. Sir, This is wrong that all of my penny stock reconsiderations work some of my penny stocks also not perform yet like Rei agro,Vishesh Info , Radaan media,BLS info but you see we book profit 25% to 200% in 30 stocks and only 4 stocks are underperform. 2. you are new on my site and I think still not read my book so I explain here my stye of investing for you and all of my new followers like you who not read my book yet. 4. 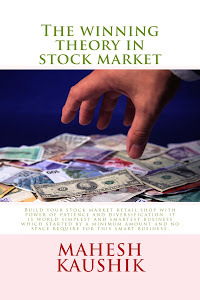 I never book loss, if a stock is in loss then I forget it and enjoy dividend income ( yes 100 % of my maheshkaushik.com recommendations have past dividend history) in case of penny share I easily forgot 4-5 stocks investment 8000 to 10000 in profit booking or 30-35 stocks and if any time stock give returns then I book profit. 5. No time frame It all depend on your experience I hold a stock minimum 1 year because i want tax free long term capital gain but if you ready to pay 15% short term capital gain tax then you may book your profits earlier. Thanks for your detailed response. Since you mentioned Rei Agro I would like to tell you that I have incurred quite a heavy loss on that stock and a few other penny stocks and that's the reason I am being so careful now. Actually I have watched all your youtube videos right after I posted this question and got the answers of most of my doubts. Thanks for posting those videos. I like your strategy of investing not more than 5000 in one stock and already started following that too. Thanks again. This stock went down to 69 level and currently trading at around 80 while your buy call was at around 90 in July 2015. Thank you Mahesh ji. Got it.